Getting solid glass to render nicely can be tricky. During the development process, we were almost finished implementing a nicer way of rendering glass, but priorities changed and work was abandoned. However, we were able to produce some really nice solid glass - see the image below. To use this in your renders, you need to insert the component into your model and use the eyedropper to sample the outside and inside glass material, and map them onto your geometry. The interior glass material (the back face of the glass) needs to be configured differently to the exterior. 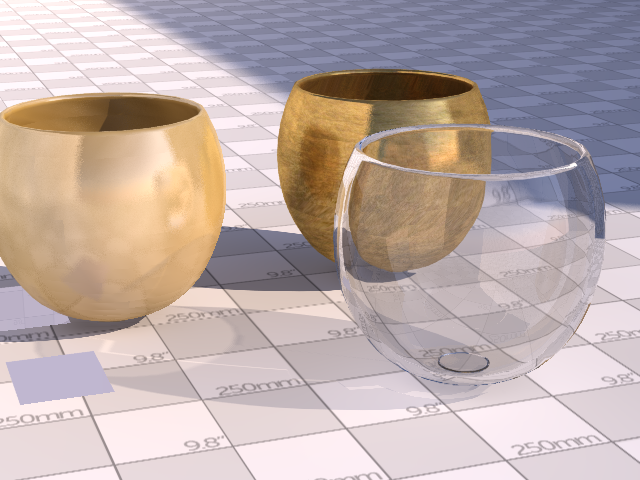 Glass is normally configured something like diffuse 0% (clear glass, no colour) transparency 90%, and reflection 10%. This gives a nice clear finish with enough reflection. For solid glass we need to add refraction. However we need to bear in mind that we are simulating the behaviour or a solid, by modelling surfaces as a series of single thin faces enclosing a volume. Glass as a material has no internal reflections, so we need to change the configuration for the internal material 'inside' the solid. This needs to be configured as diffuse 0%, transparency 100%, and reflection 0%. Refraction needs to be the same as the outside glass face material.